Three suspects including Hambantota district MP Namal Rajapaksa arrested and remanded for their alleged involvement in money laundering amounting to Rs. 45 million in two companies owned by Rajapaksa, were released under strict bail conditions by Colombo Additional Magistrate Nishantha Peiris yesterday. 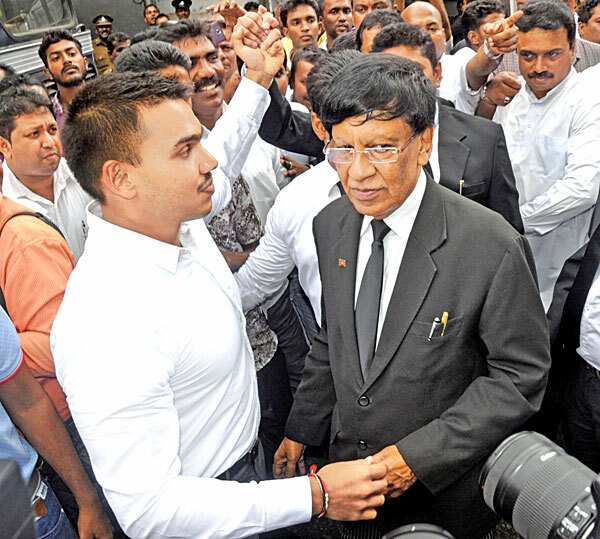 Namal, the eldest son of former President Mahinda Rajapaksa, Sudarsha Bandara Ganewatta, a director of NR Consultation Private Ltd and Nithya Senani Samaranayake who functioned as a director of NR Consultation Private Ltd and Gowers Corporation Pvt Ltd were ordered to be released on cash bail of Rs. 100,000 with four sureties of Rs. 10 million each. While ordering the suspects to be released on bail, the Additional Magistrate ordered them not to make any statement in writing or vocal, which could interfere with the investigations. The suspects were barred from leaving the country and their passports were ordered to be kept under Court custody. The suspects were further ordered to appear before FCID on the first and last Sunday of each month. President’s Counsel Jayantha Weerasinghe with counsel Sampath Mendis appearing on behalf of the suspects moved Court that their clients be released on whatever bail condition the Court deems fit. The Defence Counsel informed Court that there is no justifiable reason to refuse bail on the suspects in terms of section 14 (1) of the Bail Act. “Namal Rajapaksa would not abscond Courts since he is a Parliamentarian and a lawyer. There is no evidence to prove that the suspects would interfere with the witnesses and they assisted police investigation since the inception,” the Defence Counsel added. However, the FCID moved Court that the suspects be further remanded since they were yet to make a statement from an individual living in Bangladesh. Senior Counsel Jeewantha Jayatilleke with Counsel Ralitha Amarasena appearing on behalf on Sujani Bogollagama another suspect in the case informed Court that their client was currently receiving treatment at the Colombo National Hospital and could be present before Court by a way of an ambulance. However, the Additional Magistrate observed that the FCID has no obstacle to arrest the suspect at anytime. On August 15, Rajapaksa and Ganewatta arrested for their alleged involvement in laundering money amounting to Rs. 45 million in two companies owned by Rajapaksa, were ordered to be remanded until August 22 by Colombo Additional Magistrate Lanka Jayaratne. In this case, MP Namal Rajapaksa, Indika Prabhath Karunajeewa, Pavithra Sujani Bogollagama, Senani Samaranayake, Sudarshana Bandara Ganegoda and Iresha Silva were named as the suspects by the FCID, following instructions given by the Attorney General. At a previous occasion, the Court had issued a warrant for the arrest of second suspect Indika Prabhath Karunajeewa who had evaded police investigations since the inception. It was reported that Gowers Corporate Services (Pvt) Limited of Colombo 05, is providing coordinating services to SriLankan Airlines.